Almond extract, or Prunus amygdalus dulcis, is used in a wide variety of cooking recipes. Usually used in sweet dishes or desserts, almond extract has a very strong flavor and is therefore generally used in moderation. Almond extract is made by combining the natural oils of either bitter or sweet almonds and ethyl alcohol. Almond extract is made from the nuts of either bitter or sweet almond trees. Bitter almond trees have pink flowers while sweet almond trees have white flowers. Sweet almond extract is more expensive and takes longer to produce than bitter almond extract. Sweet almond extract is generally used in ice creams and desserts, while bitter almond extract can be used in cookies, muffins, cakes, pies, french toast and other baked goods. 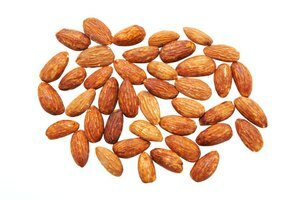 Almond extract is produced by cold pressing almonds to collect the oil. Cold pressing the almonds preserves most of the nutrients. The end result is a yellowish oil that is combined with alcohol. The flavor of the alcohol and almond oil blend together and are allowed to sit until the almond flavor is more distinct. 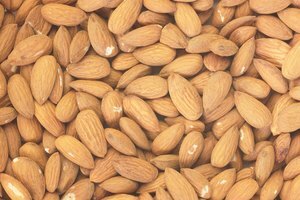 Almond extract is full of proteins, vitamins and minerals. Almonds contain good fats and a lot of fiber, and are low in carbohydrates. Not only is almond extract healthy for you, but it is also beneficial to your skin. Almond extract is used in cosmetics because it can seal in moisture, strengthening hair and skin. Almonds have also been used as an alternative medicine with aromatherapy. Almond trees flourish in warm regions. 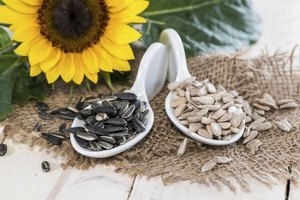 They grow significantly well in North Africa and some parts of western Asia or the Mediterranean, and in the western United States, with California being one of the major producers of almonds. Almonds became popular due to the ease of growing them and the abundance of them in France in 1372.